"There came into my young heart on that occasion a resolution to try to do what the Lord has commanded. I would that I might have the power, through the Spirit of the Lord, similarly to touch someone in this congregation today. "What marvelous things happen when men walk with faith in obedience to that which is required of them!" "If ye be willing and obedient"—I love that invitation. It defines two important aspects of our interaction with God: attitude and behavior. 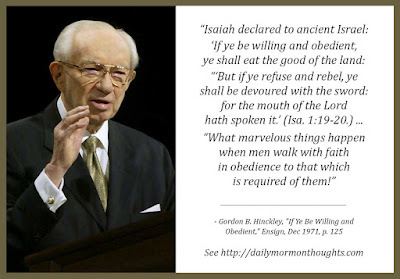 We start with willingness: the desire, the heart-felt trust and faith in Him; but it must be followed by obedience: the actions that demonstrate the depth and sincerity of the feelings. When those both are present, we are promised blessings and divine help. But if not—"if ye refuse and rebel"—we have no promise. 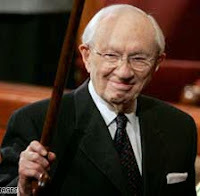 President Hinckley learned at a young age, developing a deep desire to be willing and obedient, when a prophetic testimony touched his heart. He longed to do the same for some other youth or adult listening to his words. So should we all; what a precious gift it is when we are an instrument in God's hands to touch the heart of another as spirit reaches out to spirit!